Avi-8 exploded onto the watch scene in 2013 with a huge catalog of watches inspired by aircraft -- British warplanes to be exact. 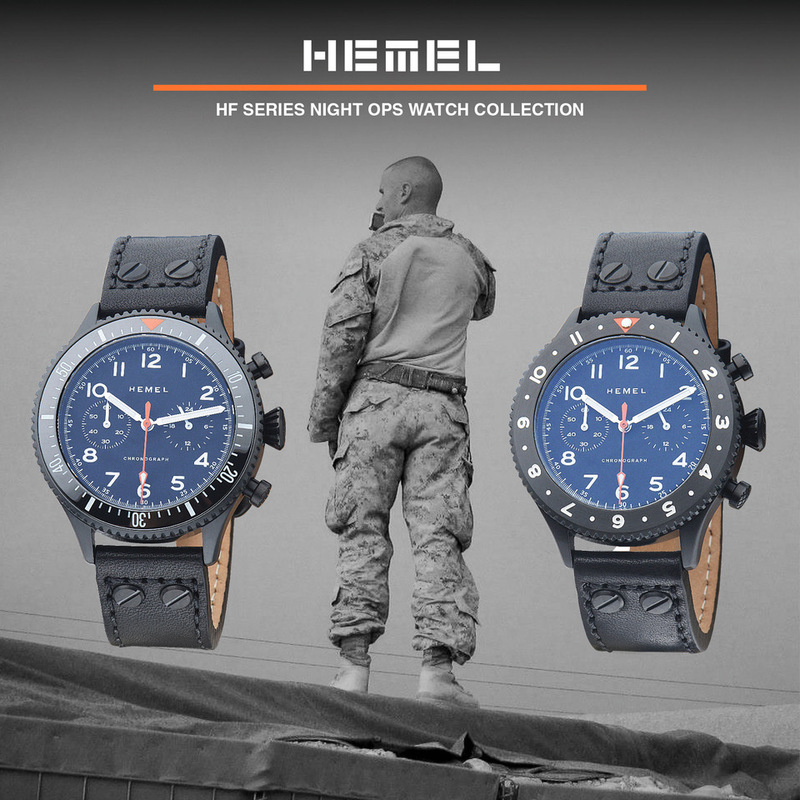 The range includes both quartz and automatic movements and a host of designs that range from the industrial to the retro to the truly off beat Harrier II collection. 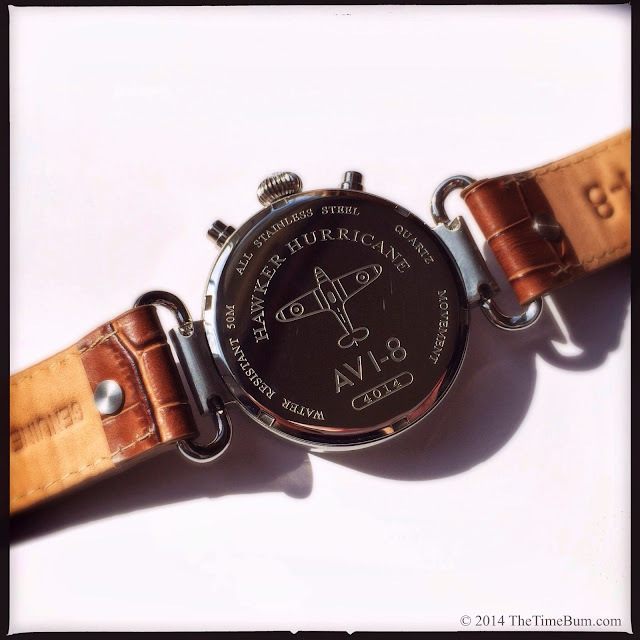 For this review, Avi-8 provided a Hawker Hurricane 4014-03. The Hurricane series is one of the more conservative in the Avi-8 catalog, consisting of vintage themed quartz chronographs, B-uhrs, and three-hand automatics, but I was attracted to the decidedly unconventional case design of the 4014, which eschews a conventional lug and bar arrangement for two large loops hinged to thick central lugs at either end of the case, not unlike some converted pocket watches. 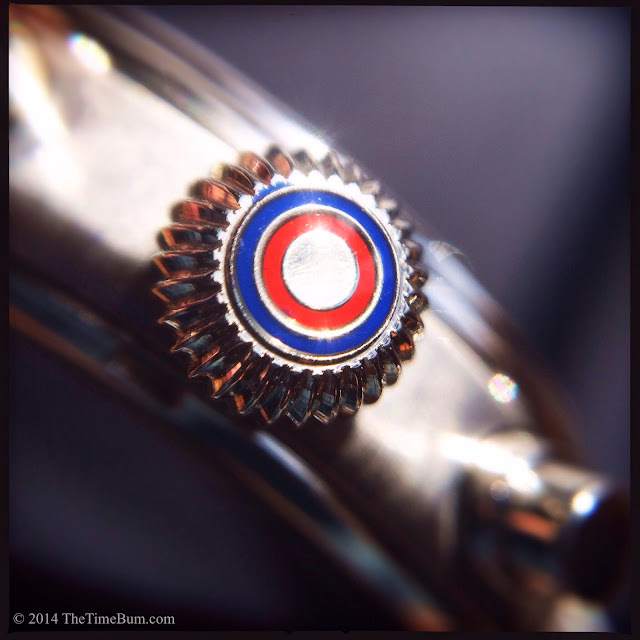 The case is 316L stainless steel with a brushed finish and polished bezel, pushers, and large onion crown which is also decorated with a very cool blue and red RAF roundel. The case back is also polished, and engraved with the image of its iconic namesake. When viewed in profile, the brushed body of the case is sandwiched by the polished case back and bi-level bezel. The bit of polish highlights the details of the case without adding too much flash. It is a large watch, 43mm diameter and 50mm lug-to-lug, which is in keeping with its aviation and pocket watch inspiration. 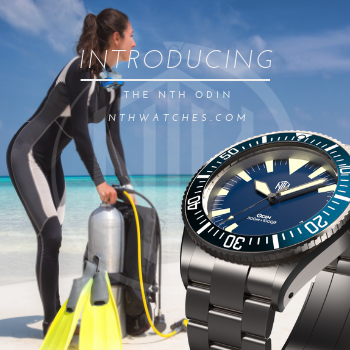 On the wrist, it shows every millimeter of its size, thanks in part to the hinged loops that extend the strap attachments far beyond a conventional lug arrangement, and the size of the dial, which appears to occupy nearly the entire surface area of the case with only the slender bezel to contain it. It is an uncommon case design that is guaranteed to attract attention and strong opinions. It is impossible to be ambivalent about it. Personally, I think the off beat design and generous size work. The same design on a smaller watch would risk looking dainty. With the large case it simply looks eccentric -- in a good way. Not to be upstaged by the case, the dial is equally unique. The 4014 is offered in black, cream, and the dark green with white numerals and indices pictured here. All hands are polished and the minute and hour hands are filled with white luminous material. 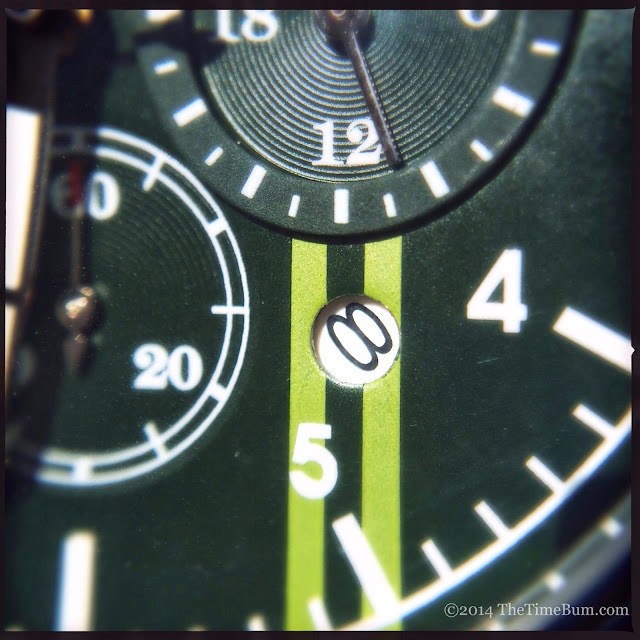 The three sub dials eliminate the 3, 6, and 9. Each is textured with concentric rings like a vinyl record album. * The 24 hour sub dial at 3 o'clock has a raised ring, the other two do not. 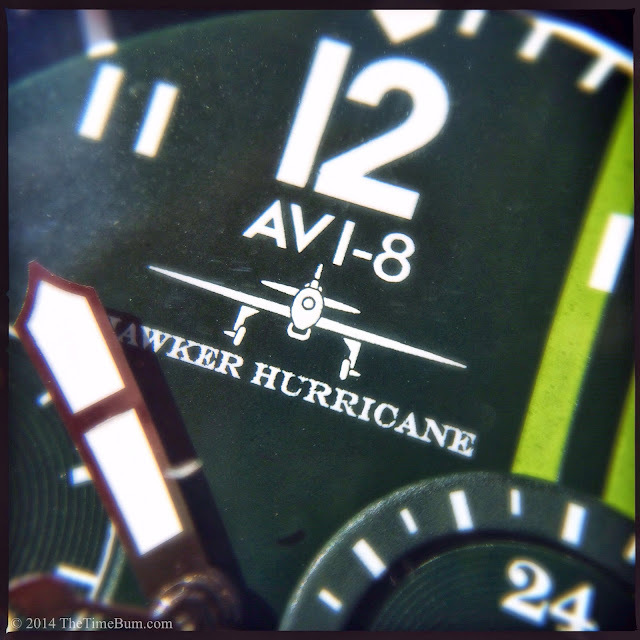 There is quite a bit of branding on the dial, with the Avi-8 logo tucked right up under the oversize 12, a slightly larger airplane silhouette beneath, and "Hawker Hurricane" in tiny print below that, forming the base of this pyramid. I would have preferred less, but does manage to fit the area and achieve some balance against the three sub dials. A porthole date window peeks through between 4 and 5 o'clock. Finally, two light green stripes run vertically from 1 o'clock to 5 o'clock. The movement is a VD53, a Japanese quartz unit that I have not encountered before. It includes sub dials for 60 minutes, 60 seconds, and 24 hours. 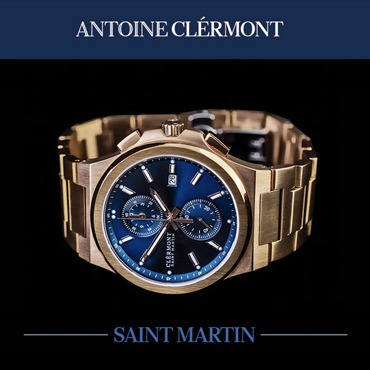 Oddly, the primary second hand is not used for the chronograph function. I discovered it was easy enough to get used to, but the small seconds does make it more difficult to read. 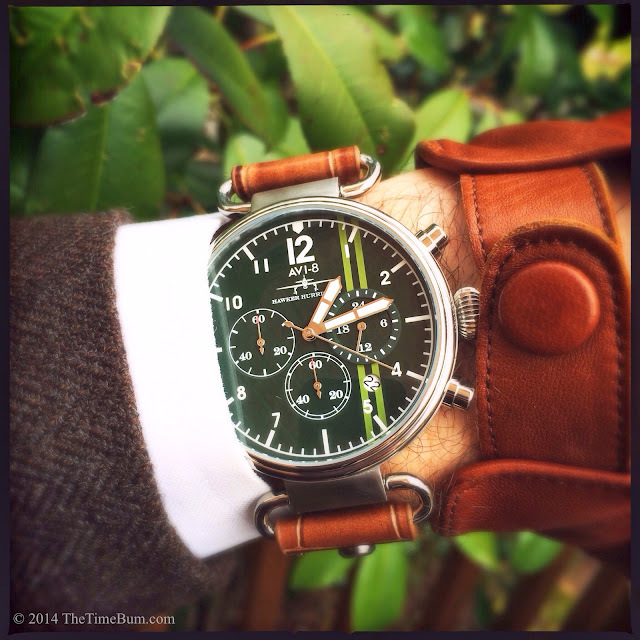 As I have found on some other chronographs, I miss having a 1/10 second sub dial. Granted, I rarely need to time anything with that degree of accuracy, but the ability to do so is one of the joys of owning a chronograph in the first place. More annoying is the absence any tactile feedback from the chronograph pushers. They depress properly, but you would never know it. I found myself double checking the small second hand to see that it was actually engaged. 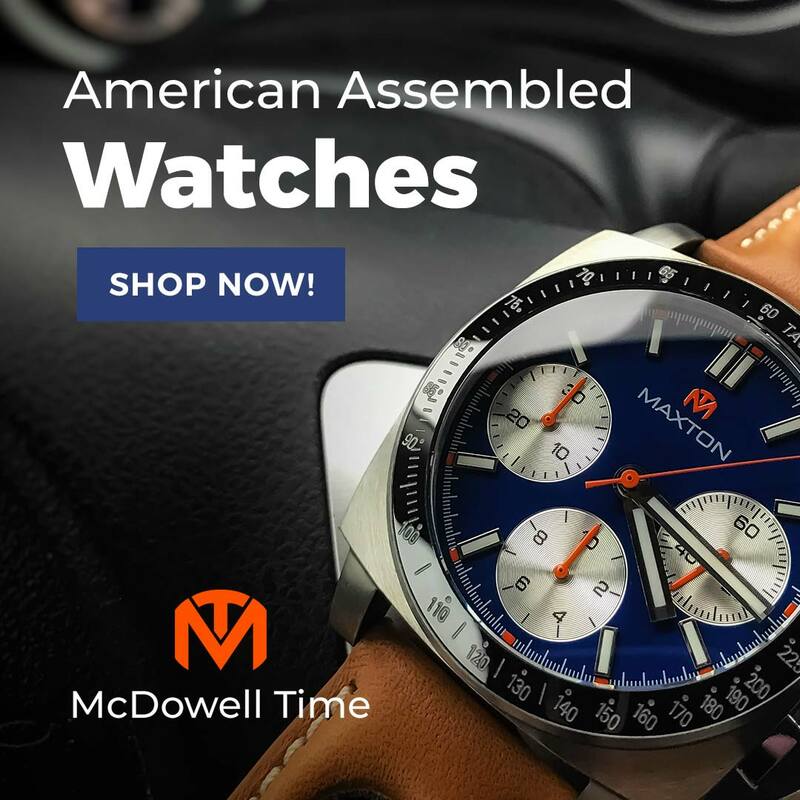 The thick, 22mm crocodile print leather strap is firmly attached to the polished loops and closes with a brushed square buckle, etched with the Avi-8 logo. It is attractive and suits the watch well, which is a good thing, because this is one of those rare times where I recommend keeping the original strap. Not that I wouldn't be curious to see it on something different, but I have no idea how one would accomplish it. The strap is fixed to the closed end of the hardware loop. The opposite end opens with a spring bar that attaches it to the case. The rivets on the strap are not functional, so they cannot be removed to release the loop. I can not see a way to remove the strap from the loop without destroying it. Best to leave it alone. The Hurricane is a sport watch, but not in the athletic sense of the word. It is more sporting like a tweed sport coat, flat cap, and driving gloves -- the sort of gear you might don if it happens to be 1939 and you are about to hop behind the wheel of your Morgan Super Sport for a quick jaunt to the pub. Or, more likely, if you are an American like me who has watched way too much Downton Abby. ** Its retro style is more fanciful than historically accurate. Stylistically, it lands somewhere in between aircraft and automotive inspirations. 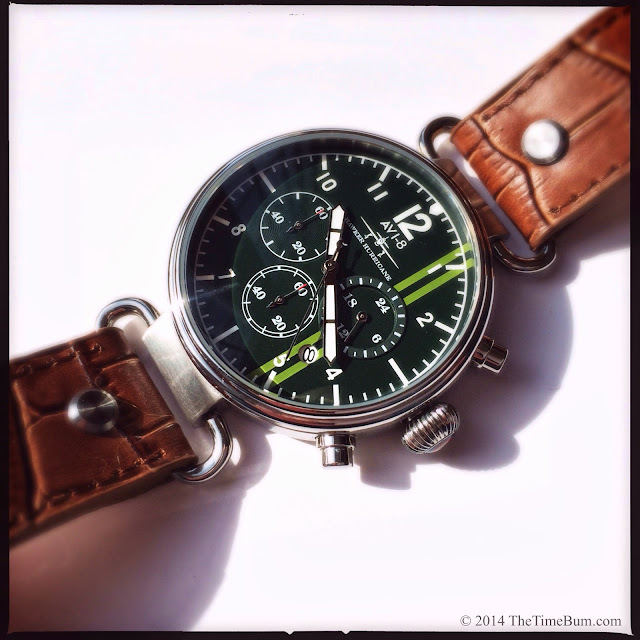 The airplane logo, riveted strap, and onion crown with RAF roundel evoke a pilot watch. Then again, it is British Racing Green with racing stripes that cross the circular date window in such a way that it resembles the number on an old racing car. 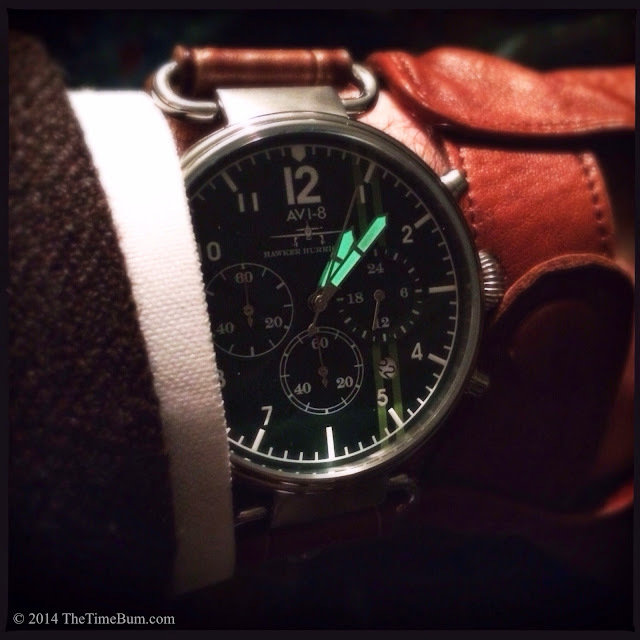 I like the stripes in theory, but in practice, I wish that Avi-8 had saved that idea for a different model. On the Hurricane, they seem a bit out of place, as if the watch can't decide what it wants to be. Sum: A fun piece if you can find it for the right price. * If you don't know what a "record" is, please don't tell me, just look it up on Wikipedia and let me grow old in peace. ** Honestly, is Lady Edith really hiding her out of wedlock baby with the pig farmer's family? That can't possibly end well. *** I apologize to the entire population of the United Kingdom for writing that last sentence.